Sitting across from Grockit CEO Farb Nivi, you’d never know that a few months ago he was spending weeks in the hospital and with tubes down his throat after getting hit by a minivan on his Vespa. One of his kidneys burst and half of it had to be removed. His recuperation was slow and painful, and it took a toll on his social learning startup as well. He lost some employees. Investors, who put in $8 million last year, began to worry about Grockit’s health as well. 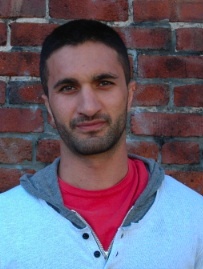 Nivi came back strong, though, and he’s about to push out a significant redesign for Grockit. The social learning site, which launched at TC50 in 2008, helps high school and college students study together for standardized tests such as the SAT, GMAT, and GRE, and connects them with tutors. It competes with Knewton and Brightstorm. The redesign (see screenshots below) does a better job highlighting the three main things students can do on Grockit: take virtual lessons from tutors, do a group study session, or practice solo. 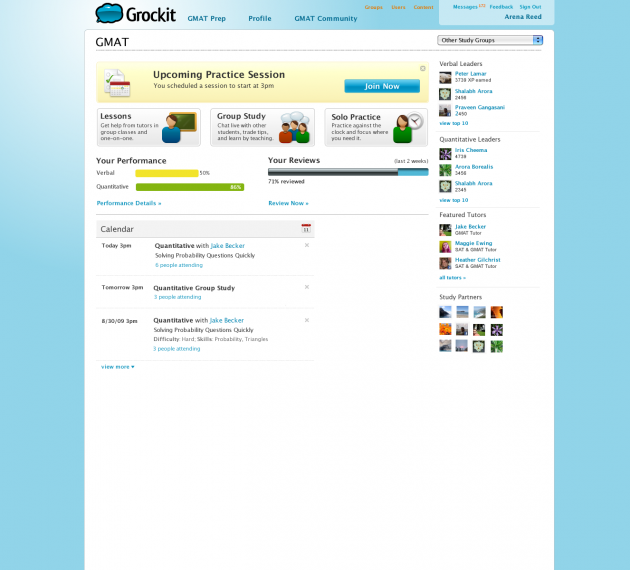 Grockit uses game mechanics to encourage participation, and is designed so that students can really help each other. It learns a student’s strengths and weaknesses over time, and serves up appropriate questions (much like Knewton does) or matches them to other students with complementary skills. The new homepage also includes a dashboard which will show students their relative performance for different skills, such as verbal or quantitative. Leaderboards for both students and tutors will be on the right. The group study sessions are live and all the students text chat with each other to figure out the answers to each question together. 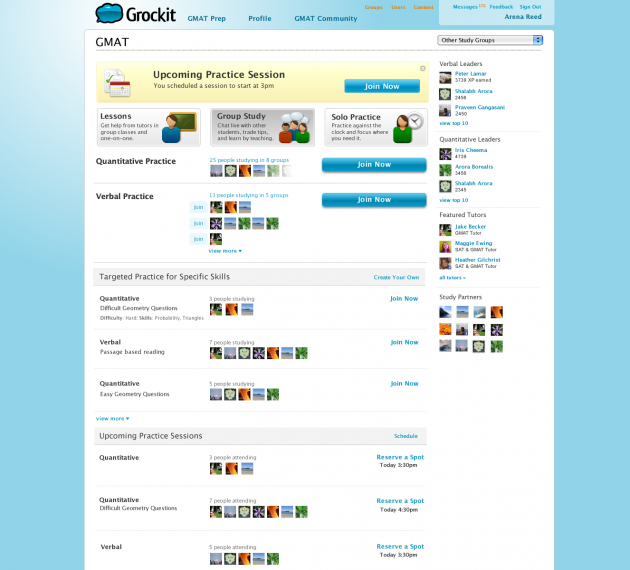 Or they can find a tutor by looking at their ratings and student testimonials, and pay for lessons and live classes right on the site (Grockit takes a 20 percent cut). 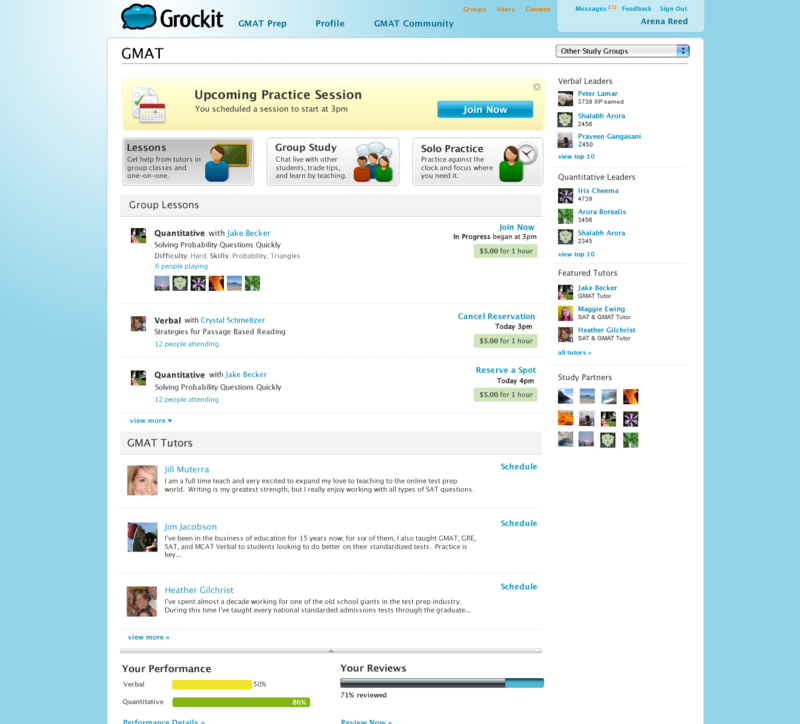 Grockit already has a small, but active community of about 10,000 students a month. Nivi plans on expanding the platform beyond standardized test prep to K-12 curriculums next spring. He will open up the platform to schools across the country and allow teachers to use it as either a primary or supplementary teaching tool to get students to practice questions across every main subject area, from math and science to social studies and history. It is a Ning model for education. He plans to create a private site for each public school in the country which can then be claimed by a teacher or administrator and used only by students of that school (at least at first). Teachers can create their own curriculums, choosing from a menu of thousands of questions for each subject, or adding their own. To me, this is where Grockit will become interesting. It could become a generalized computer learning tool across every imaginable subject. Teachers and tutors can create their own set of “test” questions, and students can play the tests out either alone or in groups. They can rate the best courses and even have online competitions to see who is the smartest. Homework may never be the same again.